Following a long, drawn-out silence on the government’s failure to adequately address the HSBC tax scandal, George Osborne has finally spoken. Washing his hands of any responsibility, the Chancellor says it is up to HSBC to puts its house in order. Details of HSBC’s Swiss operation, which allegedly aided hundreds of UK clients to conceal cash from Britain’s tax authority, was handed to UK authorities in 2010. Nevertheless, only one person has faced criminal prosecution since. Stepping out from the recesses of the Conservative cabinet chambers, Osborne broke his silence on the government’s handling of allegations directed at HSBC on Wednesday. The Chancellor conceded he had been aware of compliance-related concerns regarding the HSBC group since 2010. He said he was under the impression the bank had been passively aiding its customers in avoiding tax. He stressed, however, he knew nothing about HSBC complicity in tax evasion. 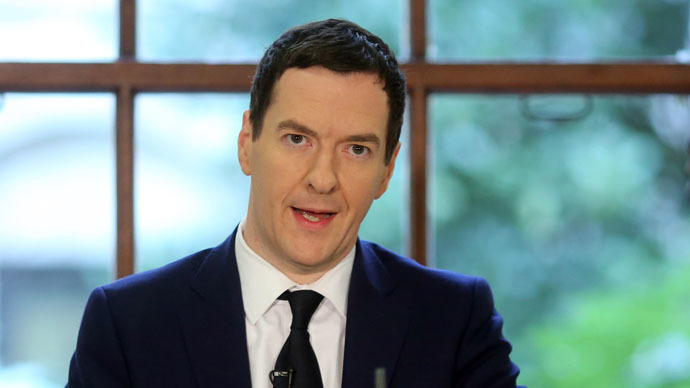 “The only thing that I was aware of was what the public was aware of,” Osborne said. Both Osborne and Prime Minister David Cameron have faced heated criticism for offering Lord Green of Hurstpierpoint, the former chief executive of HSBC, a position as trade minister in 2010. It has since emerged Green was responsible for overseeing HSBC’s disgraced Swiss operation at the time. Challenged on why they had not probed the ex-HSBC chief in 2010 about allegations directed at the bank, Osborne maintained there was no reason to. He said as far as he was concerned the HSBC leaks had uncovered tax evasion on an individual basis rather than systemic collusion by Britain’s largest bank. The Chancellor argued this was an important distinction, as his role does not require him to know the tax arrangements of ordinary UK citizens. “The published information and the information that was publicly available, and therefore the information available to me, was that certain individuals with bank accounts had potentially evaded tax and they rightly were being investigated,” he said. Details of HSBC’s Swiss customer accounts were leaked in 2009 by whistleblower Herve Falciani. The disclosure marked the biggest leak in banking history. The leaked files subsequently formed the basis of a damning investigative report, published by the International Consortium of Investigative Journalists in February. The report identified HSBC account holders involved in a range of unsavory deeds such as arms and drugs dealing and white collar crime. It also uncovered how HSBC reportedly marketed financial products designed for aggressive tax dodging. Alongside bank statements from HSBC customers were incriminating notes written by the bank’s staff, which referenced certain clients’ accounts as “black accounts.” Other notes indicated customers had requested their account not be disclosed to UK tax authorities. Critics of HSBC say these digital notes – entered mostly by HSBC customer account managers – offer evidence the bank colluded with clients wishing to evade tax. The Times probed HMRC on whether UK authorities were witness to the notes in 2010, but hasn’t so far received a reply. George Osborne dodges questions over HSBC's Stephen Green http://t.co/sJzx2Bc8NL This is obfuscation of the worst kind. On the question of why Britain has only seen one criminal prosecution since the government was made aware of the leaked HSBC files, Osborne said he trusts the judgments of UK prosecutors. The chancellor went on to praise HSBC as a prolific UK employer, and said it was up to the bank itself to clean up its affairs. Osborne is expected to announce new legislation this month, which will penalize firms, banks and tax advisers who aid clients to evade tax. Shadow Chancellor Ed Balls says Osborne has persistently dodged questions relating to HSBC and Lord Green. “He was asked six times whether he discussed allegations of tax evasion at HSBC with Lord Green, the bank’s former chairman, and six times he refused to answer,” he said. “David Cameron and George Osborne must now come clean about their discussions with Lord Green – both while he was a Tory minister and before they appointed him,” he added.